Our first night in Fira, the main town in Santorini, was a roller coaster ride. We arrived with the resolve to get a room with TV news in English and an internet-connectable-telephone if at all possible. One of the pension owners greeting our ferry approached us about his rooms. We usually find our own accommodations but decided to give his place a try. He volunteered that the room had heat, which was important in this chilly, windy weather. Questions about the TV and phone were answered with convincing reassurance, as was our concern about getting us and our bikes in his car. The road zigzagged up the caldera face from the port. We felt a little like the ‘catch of the day’ in his van as we bounced up the long, steep switch-backed road carved on the inside surface of the volcanic caldera that is Santorini. The owner flashed us the color pictures of his place and emphasized that it was clean and reconfirmed the features we discussed at the port. Our guide book says that such solicitors are legit and reasonable to use with the main caution being that you may end up far, far out of town. Our host had reassured us that his place was only a 5 minute walk from the center of town so we had thought it was time to push our edge out and learn how to room shop this way. Indeed his place was away from the center, but not far and it was very clean and fresh as he had said. It’s the biggest room we’ve been in since being in Europe this month and it would give us the unique opportunity to both be moving around in the room at the same time. It had a nice little balcony with an ocean view and a refrigerator. The telephone was conspicuous in its absence and we reminded him of our special needs, to which he assured us that a pay phone was only a minute away. After showing the modular connector to his teenage son, Bill was escorted down to the reception desk phone, which we would be allowed to use. That was more than we’d had in any room in Greece so far, so accepted that solution. The TV clearly lacked a satellite cable but we had previously agreed that we would settle for 1 out of 2 and decided to take the spacious, well-priced room ($30). We started looking around for the heat outlet and decided that our host probably thought “heat” was the word for hot water. After a little more discussion which strained his English, we learned we could pay $7 extra for using the heat function of the air conditioner. Paying extra for heat in the Mediterranean is ‘done’ so we went with it. With somewhat mixed feeling about our room, we headed out in search of an internet shop that would allow us to connect our laptop and give us more flexibility than using the phone in the reception area. After some hassles, Bill was able to connect for the first time since arriving in Greece 3 weeks ago and we were relieved to set free the emails trapped on our laptop. Then at a rare restaurant dinner we had the unexpected companion of English TV news. In unexpected ways our ‘want list’ items for Santorini were being met and we were feeling more and more comfortable with our room choice. Back at the room however the heat situation was less than reassuring. Three hours of running the heating unit had made a perceivable improvement in the chilly room situation, but not enough to be comfortable even with our coats on. We fiddled with the controls and decided the system was max’ed out. I began getting concerned about being warm enough to be pleasant company and warm enough to sleep. Bill volunteered to ask for a second blanket as our host had earlier demonstrated that “blanket” was a part of his vocabulary. We decided that we would bail out after the 2 nights we had paid for and move to a more comfortable hotel for the remainder of our stay in Santorini. “Do you want the first shower or the second?” is our daily opportunity at gambling. The first shower gives the greatest likelihood of a hot shower from beginning to end whereas the second shower person gets the benefit of the first person’s experience, which can be huge. Important tidbits that get passed along are: temperature and pressure fluctuations; are the hot and cold knobs switched; do the knobs control the water pressure in a predictable way; does the drain back-up; and tips on keeping the room floor dry, if possible. Tonight’s best shower was definitely the second shower, as the hot water was ample and Bill’s experience as the first one to shower was literally shocking. After Bill took his shower he laid across the bed gazing towards the bathroom door looking like a person who had emerged from a snake pit saying “I’m not going to take another shower in there, it’s not safe.” His grave expression didn’t jive with the usual issues around bathing. But indeed, he had been getting electrical shocks each time he touched any of the metal on the hand-held shower head, metal wrapped hose, or the faucets. I had noticed the room lights dimming periodically as he showered and that dimming and the odd noise apparently were occurring when we was getting zapped. And in Europe we are dealing with 220v, not the milder 110v of the States. I was so chilled that I wasn’t going to miss my one opportunity to warm up in the shower, shocks or no shocks. I interrogated him as to how and when he got shocked and planned my modifications—cashing in on the advantages of being #2. I hung a plastic hanger on a ceramic hook on the bathroom wall onto which I attached the shower head with a Velcro strap. I dug out a 4” diameter flexible rubber disc that we carry as a generic drain plug cover to allow me to turn the faucet knobs without touching them directly. The system worked reasonably well. When the water came on the shower head sprayed partly into the room and I just followed the spray, as there was no shower curtain and there were floor drains in both the shower stall area and in the rest of the tiny room. I only got zapped a couple of times when the metal wrap around the hose swayed against my leg. When the hanger no longer stayed in place on the wall I used it as a handle for the shower head. I got my shower, I got warm and I only got a couple of shocks in the process. For different reasons (Bill the zaps, me the cold) we vowed to move in the morning whether we got a refund for the second prepaid night or not. The chill of the room was sinking in as we looked towards going to bed. I didn’t put my faith in the 2 thick synthetic blankets and pulled out my heaviest wooly socks to complete my set of long johns for a sleeping suit. Bill gave up any hopes of reading in bed after he had been between the sheets for a few minutes and decided his hands would get too cold. I tossed him his heaviest socks before tucking myself in. It wasn’t long until Bill was up to retrieve his long johns and I took the opportunity to ask him to fetch my skull cap as I was still cold. We shivered together and teased by threatening the other with the touch of a chilled hand. But as we struggled to warm-up we decided that our best bet was in turning off the heater as the robust fan on the unit seemed to only be creating a wind chill effect and not warming the room. Clinging to each other looked like our only hope of staying warm through the night. Plastering ourselves against each other was essential. We started out on our sides facing to the right. When one of us got too uncomfortable we would roll on to our backs. Then one would roll onto the left side and like a magnet, the second would follow. Asleep or awake we stayed glued to each other all night for the extra warmth, like puppies before their eyes are open. It was a difficult night of struggling to keep warm, of grasping for the elusive sleep, and relieving the muscles that ached from the cold-dictated awkward positions. We were stiff and creaky feeling in the morning and it took some systematic stretching to restore the symmetry in my body. We were up too early to be able to check-in to our new hotel so we decided to go for a walk to warm up. We assumed the temperature outside was probably about the same as in our room—in the low 50’s—but we would warm quickly with a brisk walk despite the wind. This experience once again reminded us that we are clear that we’re not adventure travelers and that we don’t need the challenges of sleeping in haystacks and in farmer’s fields to test us—we feel sufficiently challenged just spending the night in rented accommodations. Moving up to a little bit more expensive hotel got us a lot more: the room is comfortably warm, even the mid-day hours when the heat is off; we have a very short bathtub that provides a deeply-warming soak on these cold days; FINALLY we have a telephone that Bill can use to connect our laptop to the internet; and we have several TV stations of English speaking news. We get the BBC, a snowy-looking reception from Fox News, and a German station. If we were to get 1 station only we would chose European CNN because of the analysis and the background stories (and the weather overview) that only they do but unfortunately that’s the one English station we are missing. But we are familiar with the German station Deutsche Welle (DW) that does half their programming in German and half in English. They alternate doing identical programming in each language and often do interesting in-depth stories. Today we caught the tail-end of a documentary-styled program about how Iraq became a nuclear weapons player with the assistance of Jacque Chirac in the 1970’s. DW will give us a look at the European perspective on the war, not just the coalition view. It’s only taken a few hours for the war coverage to become redundant but we are pleased to no longer struggle to get any news—now we get to struggle like everyone else at getting new news. One other partial resource we get on Greek TV is some coverage from the Arab network Al Jazeera. Of course normally we can’t understand the audio but when they started flashing the video and English audio of the questioning of the first 4 US POW’s we instantly knew what we were seeing. There had been much talk of the video on Fox and the BBC but they weren’t showing it at that time on principle. It was odd to realize that we were seeing that video that was unavailable to most Americans and Brit’s. And boy, did those kids look scared. The sober scene turned briefly humorous when one young solider broke protocol and said: “I’m from Kansas. I didn’t come here to shoot nobody. I’m a mechanic. I jess fix things that’s broke.” He had the unflattering version of stereotypic Kansas written all over his face and he looked like he was in way over his head. Of course, the humorous moment quickly vanished as we again considered the plight of these young POW’s. We haven’t heard anymore about them and hope they have been rescued. Snow on the Greek islands??? 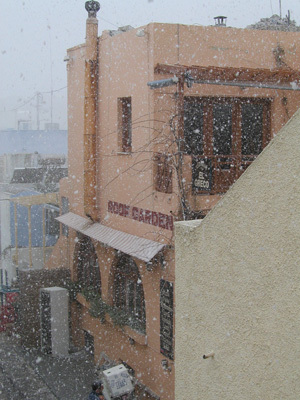 We were all packed up this morning to go for our first bike ride on Santorini when we looked out the window to see snow flakes. At first I was sure it was lint off a shaken rug or some environmentally insensitive polluting but it wasn’t, it was snow. There was an enormous gray cloud over the ocean and we trusted that in 10 minutes this surely historic snow storm would be over. It was, but then another batch of flurries arrived and then another alternated with big patches of blue sky. The snow wasn’t sticking, but it wasn’t a good omen for our bike ride either. Sure that the snow just couldn’t amount to anything we headed out of our room to load up our bikes but were stopped in our tracks, this time by the sound of the wind while still indoors. Our room was more sheltered than we realized and the fierceness of the wind sent us back up to our room to reconsider. Back at the room, we did now notice the flakes out our window were being blown horizontally. Pumice & lava layers on Santorini. We’ve spent so much time sitting indoors this last week and since it was just light snow and not heavy rain we decided to head out for a walk down to the town’s old port. We thought that the steep inside walls of this volcanic caldera would be partially sheltered from the wind, which it was. Santorini is a caldera type volcano like Crater Lake and Mt St Helens back in our Pacific Northwest, but Santorini’s caldera is huge and is surrounded on all sides by water. The current caldera was created around 1650 bce by one of the largest explosions in recorded history. And about half of the caldera that formed then is missing since ‘an event’ in 1570 ce. Those explosive bits of history combined with the awareness that this is an almost SUBMERGED caldera rim give me a slightly uneasy feeling. That unstable, sinking feeling was only made worse by looking up as we were arriving and seeing all the buildings that were hanging on the edge of the nearly vertical interior walls of the caldera. “Get back, get back” I wanted to shout. “What do you think you are doing building on the edge of a caldera on a sinking island that has almost daily, albeit unperceivable earthquakes?” Looked like “Malibu Syndrome” to me—building on the edge of slipping-away-into-the-sea hillsides. I’m sure the view is incredible but I like a little more sense of stability under my feet. And indeed, the several towns on the island have never fully recovered from the 7.8 earthquake that struck in 1956. Courageous, cliff-edge building on unstable land. It took us some time to ‘get it’ that Santorini is almost entirely the product of volcanic eruptions, hence the gravity-obedient layers (there is 1 older limestone mountain and a few other ancient deposits on the island.) And these volcanic layers are eye-popping. The colors range from dull black to a stunning, deep redwood-red, on to a coppery orange into a range of browns and beiges to chalky whites. 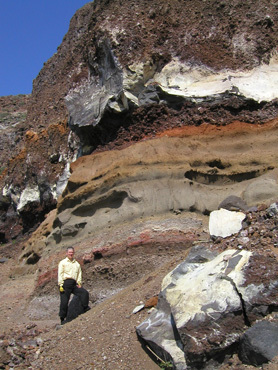 The volcanic material includes thick, basalt-like lava layers, piled layers of ordinary looking rocks, pumice, cinder, sand and ash. And the rocks themselves range from grit and gravel up to car-sized boulders. These various sized rocks weren’t at all shy about taking up residence in any layer: some deep layers are assemblies of similar sized rocks, some layers are fine ash peppered with gravelly chunks, and occasionally an enormous boulder will have bombed its way into just about any layer of ash, pumice or rocks. 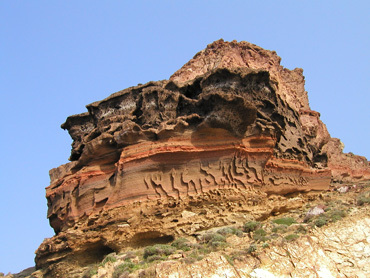 The volcanically produced layers vary from being measured in inches (or centimeters) to yards or meters. Many of the layers have sheer faces with some revealing shallow tunnels and pockets that look like the glass wall side of a kid’s ant farm. Some cliffs look as though they have a thick lacework pattern coating the surface that we assume is the result of creatively uneven erosion. And like in Turkey’s Cappadoccia region, some of these tuff and other layers have been suitable for cave dwellings. 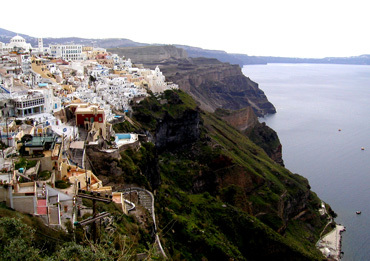 Unlike Cappadoccia’s mini-city complexes of multiple stories, most of Santorini’s cave dwellings are only multi-roomed. But homes and stables were carved into the soft layers especially in the wind sheltered shallow ravines and washes. And some of these are still in use today as homes, hotels or crude storage areas. And speaking of shades: one of my favorite little urban hillsides in Portland is covered with a mix of conifers and deciduous trees (at the south end of Duniway Park by the Y) which in the spring has almost has as many shades of green as the custom mix counter in a paint store. Looking up at all those different greens filled me with awe each spring and my delight has come to mind as we tour the Cyclades Greek islands where there is almost no green to be seen and I found myself asking “Why would anyone live where there are no trees?” Yes, I realize that is a little narrow minded but it reflects my roots, which have always literally been surrounded by trees. So, for someone like me, these all but treeless islands seem inadequate and a bit hostile. And I can only imagine how I’d feel about the tree shortage if it were warm or hot out with the only shade being that which you buy with the purchase of a drink. 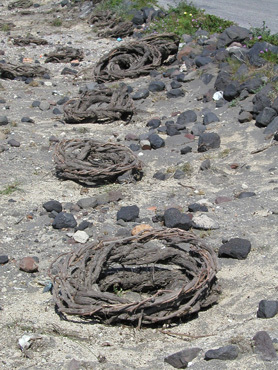 Santorini grape vines in volcanic soil. Grapes are another important industry and even the vineyards are like none I’ve ever seen before. The fields look akin to the debris you clean out of a fireplace: gray-white ash and cinder with black chunks. Here, the black chunks aren’t carbonized wood but volcanic rocks. These vineyards are tilled and leveled volcanic fields of ash and pumice with chunks of volcanic rock scattered about. And the grape plants are unlikely looking too as they are 2’ diameter, gray-brown coils of mature vines lifelessly lying on the ground. They are dormant now and some look like vine wreaths while others look like 1’ high baskets strewn about. I assumed that in the spring these coils would carefully be unraveled and the vines staked up. But as we road today I began imagining that perhaps on this relentlessly fast draining ‘soil’ that maybe they were never uncoiled, which is indeed the case. The new growth springs out from the coils and I imagine they look like squash plants as they bear fruit—20-40 pounds per plant. After harvest, all the new little branches must be trimmed back and the new length of the vine tucked into the coil. But these dead-looking grape vines do little at this time of year to make Santorini’s vegetation look any less sparse. There are some low scrubby plants growing, prickly pear where it has been nurtured, and a prized tree here and there at the grander homes and that’s about it. Well, we were finally able to get some riding in on Santorini. The winds slowly tapered off a little each day and we didn’t wait for any more of an invitation. Most of our rides were modest 20-25 milers but usually with 2,000-3,000’ elevation gain, which is a very efficient way to recondition. The climbing was a good challenge but being relatively unloaded kept the climbs from being a strain. I say relatively unloaded as we seem incapable of riding very light these days. Our “self-sufficient, foreigners in a strange land mentality” keeps some weight in our panniers all the time. Even for these short day rides we carry a pair of walking sandals for unexpected sight seeing side trips; a jacket; frequently used ‘just incase it gets cold’ accessories like a hat, gloves, and a vest; bike tools; first aid supplies; lots of water; a substantial lunch; and things that are always attached to our bikes like 2 locks, a spare tire and tube, and a mini pump. No ‘naked riding’ for us where you just going out with a water bottle, an energy bar, and a credit card. 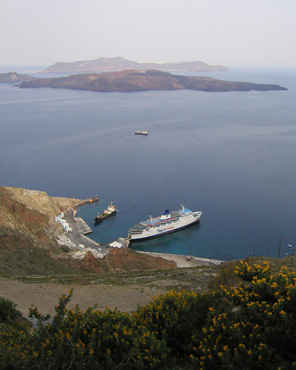 A ferry docked in Santorini's port. Our pedaling reminded us that we were riding on a volcano, which means you are either going up for long stretches or going down for long stretches. None of that silly “up, down, up, down” or “rollers” as cyclists call them. These cone shaped volcanoes, or in Santorini’s case, remnants of a cone, don’t have a complicated topography. Santorini is a small island and we covered most of the major roads at least once in our 5 day rides. We rode to the top of the 1800’ limestone mountain and dropped down to sea level at 3 of the different ports on the island and we did some detours just to add more miles and some extra climbing—and of course sightseeing. Europeans and Americans are equally surprised at our reports on the price differences in products on the 2 continents, especially for electronics and bikes and bike parts. Just today Bill was looking in the window of a shop selling handheld computers. He saw the 3 year old Visor model that I had been using up until a month ago. Here in Greece it was $335. In the US it is an obsolete model no longer available new and we sold mine for about $35, which was a little higher than the E-bay auction price. My spiffy new model that has all the feature enhancements that one expects 3 years later for a piece of computer hardware cost about $240. We cringe to think what our current models would cost here. We are meticulous about postponing most of our annual shopping until we get back home and probably brought back 20 pounds and hundreds of dollars of bike parts with us this year. Almost regardless of the country of origin, specialty products are cheaper in the US. Bikes and bike parts, outdoor wear, camping gear, camera batteries, and electronics are the things we primary shop for and the savings at home on these items is huge—sometimes 50%. Paperback books are also quite a bit more expensive abroad. A paperback copy of “Zorba the Greek” was $15 and I passed on buying a 200 page paperback on Minoan history for $40—the few photos were black and white. Food costs are roughly the same, varying quite a bit with the country, the size and sophistication of the market and the season. We eat a pile of produce everyday that we can and here like at home that represents a chunk of our grocery bill. Talking with a young Texan while we waited for our 2-hour delayed ferry to Crete we heard that the war sounded like it was going a lot better on US TV than overseas coverage and he had just sent off an email back home expressing that opinion. Of course we only see the European view, which indeed has made the war look like a political disaster and marginal at best from a military perspective. Our new source of news is EuroNews and it appears to be coming from Vienna. They reported that some of the coalition forces were now rationed to one meal a day because of supply shortages. And regardless of the network, we have heard of nothing but outrage about the war by most governments and most populations since the beginning of the war. Today, one of the bits of coverage was showing the US’s TV military recruiting campaign that began the first day of the war and the flood of Moslem volunteers crossing into Iraq to fight the coalition. One Egyptian interviewed said he wasn’t fighting for Saddam Hussein but fighting against America’s Zionism and our grab for oil. Others speak of fighting American imperialism and colonialism. The commentator noted that the Iraki’s (whoops, that is how we most often see Iraq spelled) are promoting this international brigade to demonstrate that they are not as isolated as it might seem. On EuroNews’ sampling of other European reporting, it was disappointing to see that even some grade school kids interviewed in Switzerland believe the war is over oil and only oil. 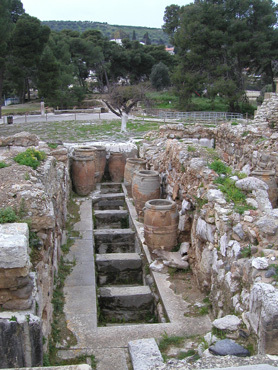 A Minoan underground storage system. CNN just popped up on our latest channel surf (which is why we periodically surf) so it will be interesting to compare the coverage. They are reporting that the Americans want to let the drivers delivering water to the Iraqi’s charge for the water whereas the British want it given away. There isn’t much that we hear about the US position or approach that is helping our image, regardless of the source. But back to Greece: we finally made it to our primary Greek destination of Crete to do some serious riding and learn more about the Minoans. 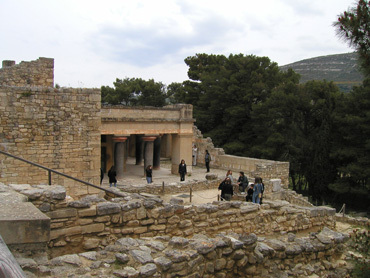 The Minoan’s were an ancient culture that got cooking on Crete around 3000 bce and were building 4-storey palaces with toilets and sewage systems by 1700 bce. They even had carbon filters in their drinking water pipelines and are credited with building the first road in Europe. And the Minoans followed the Sumerians example and created an alphabet to assist in inventorying their extensive stores of agricultural products for their managed economy. The Minoans traded with their neighbors, including the Egyptians, Syrians and Babylonians. The Mycenaean’s based on mainland Greece overran them and both the Minoan and Mycenaean cultures contributed to that of the ancient Greeks. Crete was on our itinerary specifically to see the remains of this impressive Minoan culture, especially the remnants of the palace at Knossos, but we were disappointed by what we saw. I was reminded of the Tour d’ France which is actually more interesting on TV than in person and likewise, I think the Minoan culture reads better in a book than it looks in ruins. You just can’t see the good stuff at the ruins—the really innovative things that they did. The partially reconstructed Minoan palace. But the Minoan pottery at the main Crete museum in Iraklio (aka Iraklion, Heraklion) was surprisingly bold and spirited. My favorite pots ranged from 2700 to 1400 bce and were finely crafted. 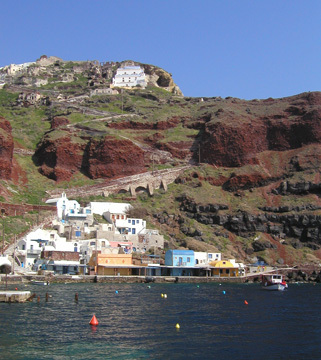 We had learned that the potters on Santorini couldn’t make as fine a ware because they lacked the high grade of clay that their neighbors on Crete had and we sure saw the difference. Some of the cups and bowls looked like they were only a step or two away from porcelain in their thinness. But it was the creativity of the surface textures that was so captivating with such things as a field of bumpy knobs covering all or part of a squat pot; several dozen 1 1/2” spikes radiating off an imposing pitcher; parallel, raised swirled, knife-edged ribs; ½” deep dimples around the throat of a vessel; pitchers with horizontal, trough-like spouts that are as long as the pitcher is wide; wavy upper edges on a bowl; or 4 large, daisy blossoms protruding like points on a compass from a 3’ tall vessel. The orange, black, brown, and white applied colors tended to be bold and in sweeping strokes and a large pot might have a single, sunflower-like bloom covering the entire surface; or be covered with a wiggly looking octopus or squid with vegetation filling in; or have a repetition of rush leaves almost looking like a slanted harlequin pattern. Clearly they were making pots before the rule book had been written and no one had told them that you just don’t do things like that. Minoan pottery was wildly creative. It was startling to see my enthusiasm wane as I was looking at all of these wonderful ceramics and then I took a second look—I had moved into a display area of Cretan but post-Minoan pottery. 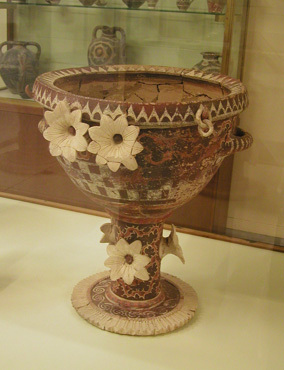 The Mycenaean's and then the Greeks took over Crete and the effect of their stylist rule books shouted as the containers became much more contained and exhibited a diminished lexicon of surface embellishments. Of course they were nicely done but lacked the pizzazz of the Minoans. I longed to revisit the Athens archeological museum after seeing this museum on Crete. As is often the case, it is the big-city museum that gets all the good stuff (no matter how far away). I remember simultaneously learning about the Minoans and seeing the wonderful finds in Athens and now that I have been to the home of the Minoans I would love to take a second look. But alas, the museum in Athens is closed for at least another year as a part of the country’s effort to spiff-up for the 2004 Olympics. Maybe in 2005 we can revisit the museum in Athens and pick-up our postponed Turkey itinerary. Darn it anyway, but the winds and rain greeted us on Crete too. But the weather cleared enough for us to make our break out of town and we have begun our perhaps month-long jaunt around the island of Crete and onto the mountain plateaus. We picked up an off-the-beaten-path guide book written for motorcyclists that will give Map Man routes to choose from rather than creating all his routes from scratch. The Greeks are still cordial despite the war and we are very at ease as tourists here.